Dogs on a blanket - Max, Ani, Angus and Abi. 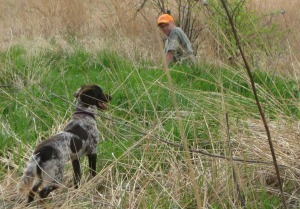 John, fox hunting in South Dakota. John & Abi, NAVHDA Test 2014. Hunting Hills Uma Abigale (Abi) at 8 weeks old. 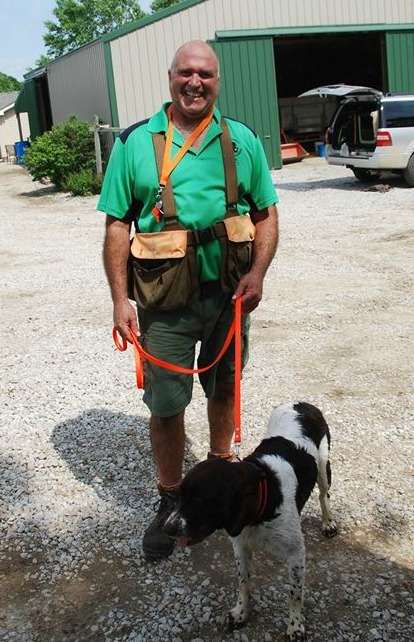 Angus took 3rd place in the bird derby! Angus, quite the handsome guy! Angus cooling off in a water trough in Nebraska. Ani in the brush in Iowa. Going to socialize (and shop) at Bass Pro. 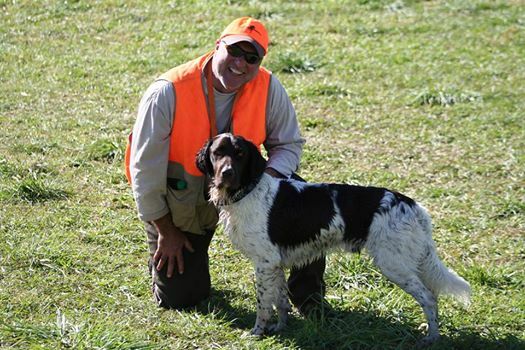 Fun Hunt in Nebraska, 2013. Ani, coming in from the cold! Our Utski scored a Prize II today on his UPT - one point away from Prize I but that's ok, we'll take it!! Ken Hamele. 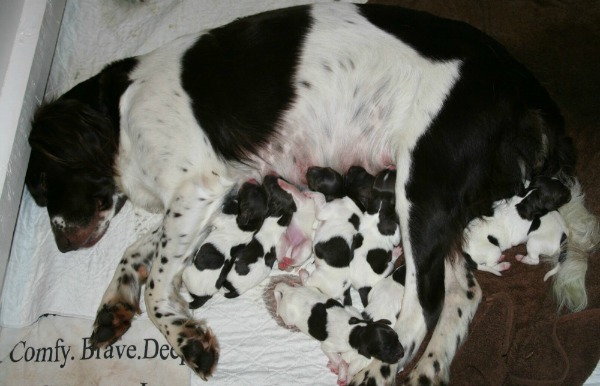 11 beautiful puppies! Welcome to another litter sired by Angus with Shippy Ranch's Bella! Beautiful puppies! we are keeping one of the females, Violet. Welcome to the US little Munsters! We're proud to announce our Uros EBEN-EZER scored a perfect 112 Prize I on his NA test today! 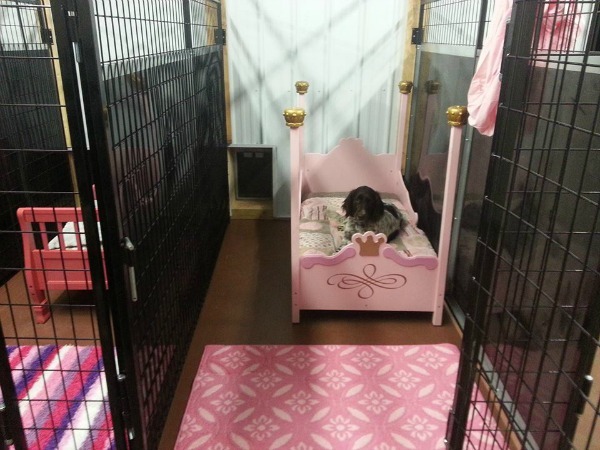 Kennels are up and beds in the kennel - here's Daeny in her "room." 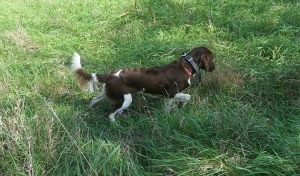 Angus's pup Birdy (with Shippy Ranch's Bella) won Prize I perfect score today on her NAVHDA NA test. Congratulations Birdy and owner Aaron Tyznik! 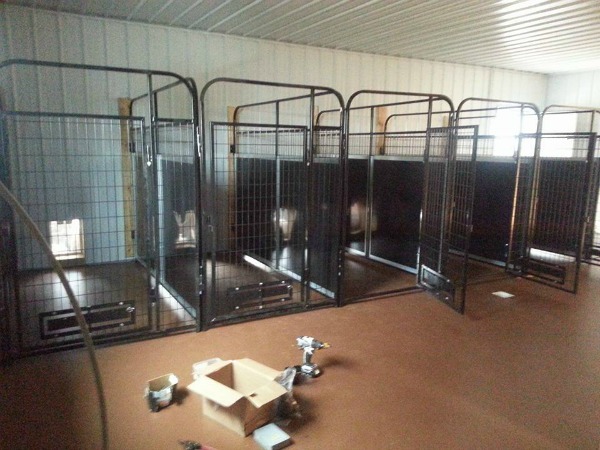 Got the exterior of the kennel done, now working on the inside! 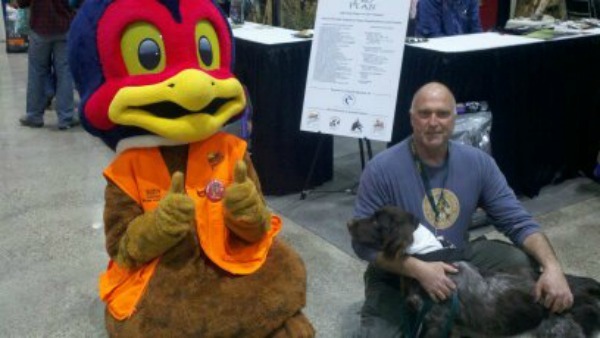 Pheasant Fest 2016 at Bartle Hall in Kansas City - John and Angus holding down the booth and our Munsters on parade! 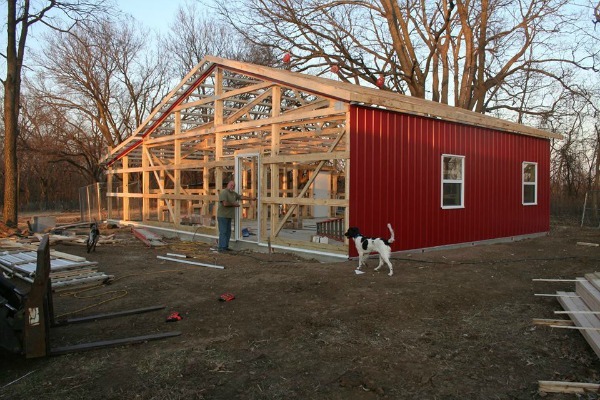 Starting work on the outside kennel - we'll have 6 interior kennels with an office, puppy playroom and whelping room. 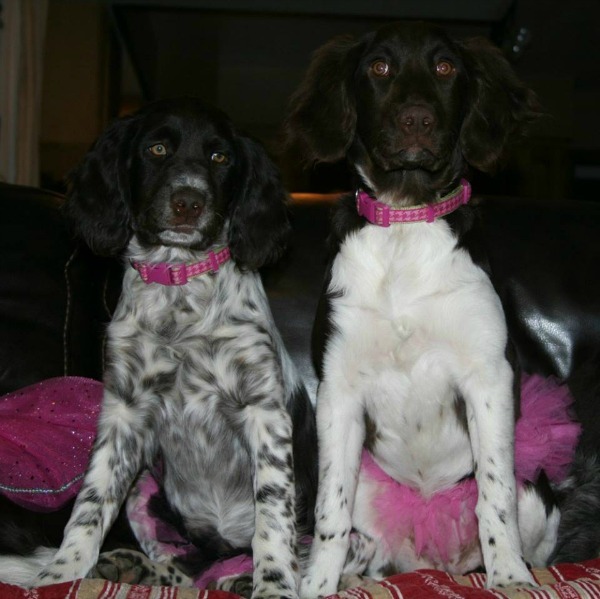 Happy Valentines Day from the puppies in pink (Daeny and Emmie) at Mustain Kennels! 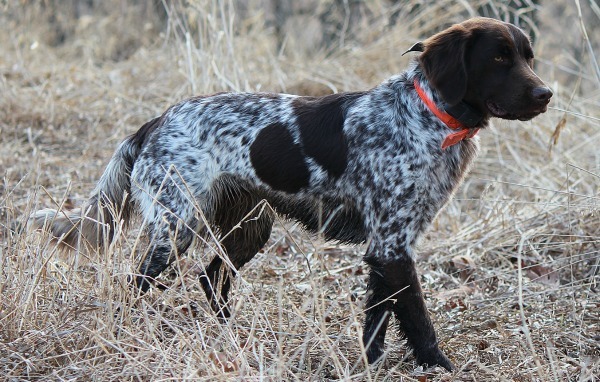 Happy New Year Everyone - wishing you the best in 2016 from Mustain Kennels! 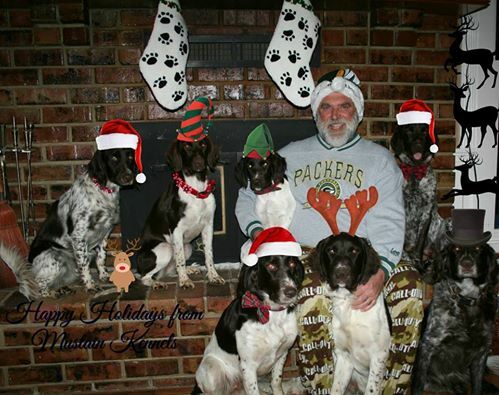 Merry Christmas from Mustain Kennels - Daeny, Emmie, Stormie, Abi. On the floor - Asia, Utski and Angus. 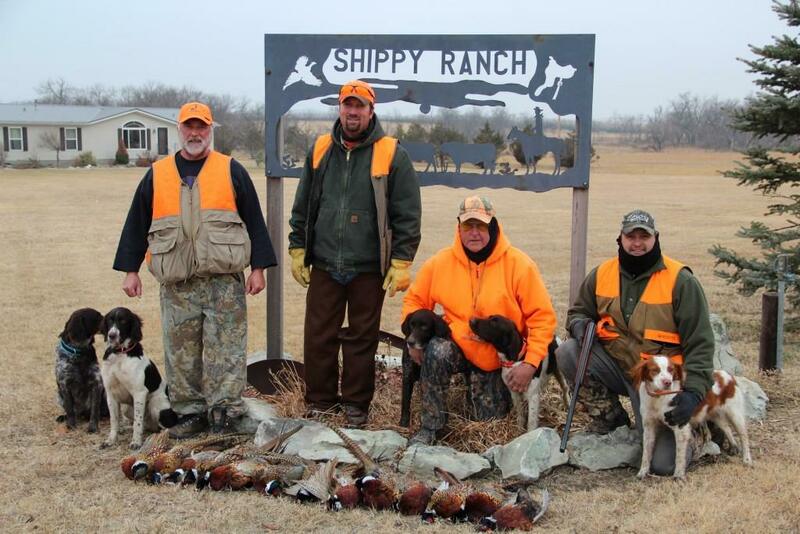 dogs did great, our team did well, 14 birds in 2 hours - go team Shippy!" Welcome little Cohen von Blazing, Abi's single pup! Above: (L to R) Angus, Stormie, Asia, Abi, Dani, Emmie and Uros. 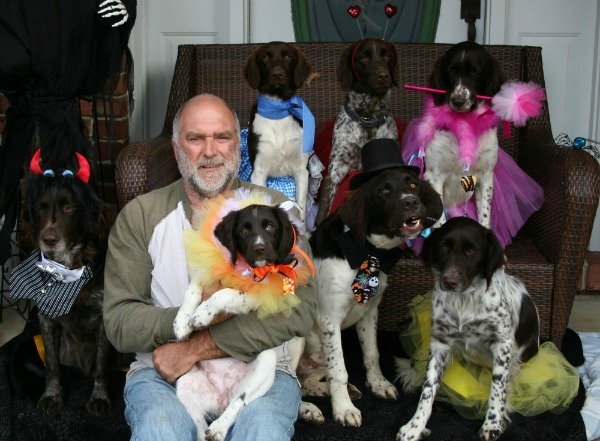 Happy Halloween to everyone from the Monster Munsters at Mustain Kennels (say that 3 times fast!). Above: (L to R) Angus, John holding Stormie, Uros and Dani. Back row Emmie, Abi and Asia. We're very proud to announce that both of our youngest girls, Timber Trails Emma (Emmie, left) and Robingun's Daenerys Storm von Etta (Dani, right) scored a Prize I on their NAVHDA Natural Ability tests today! 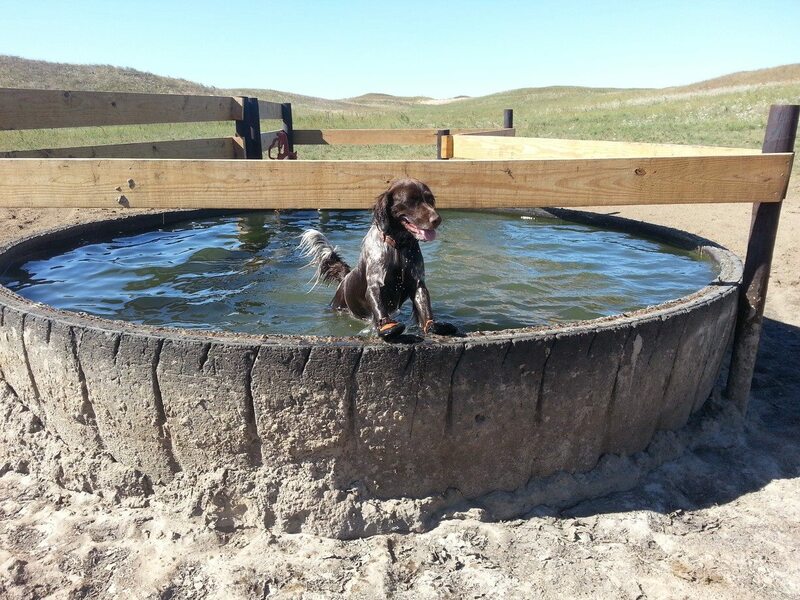 Doing a little hunting up in South Dakota and wanted to share this picture of Angus cooling off in the water tank! 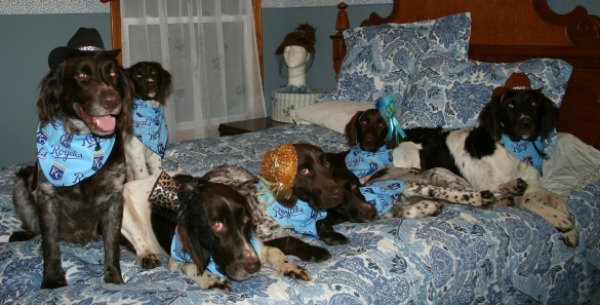 From the pups at Mustain Kennels, wishing you a Happy Dog Day! 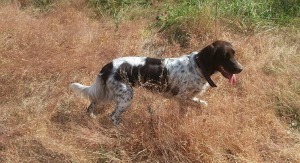 We received wonderful news today - Asia was approved by the SMCNA for breeding. 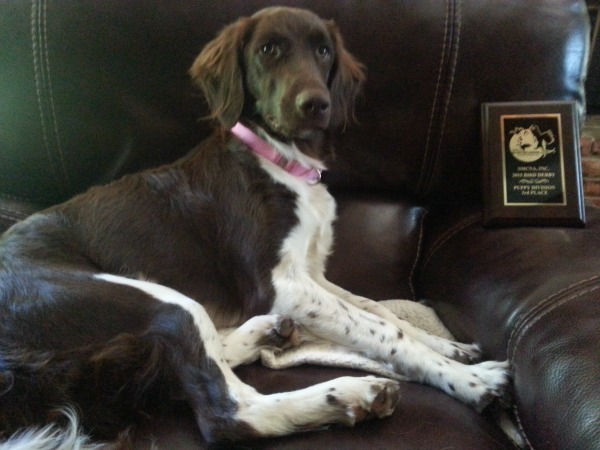 She took her NAVHDA Natural Ability test in May and scored a perfect 112. 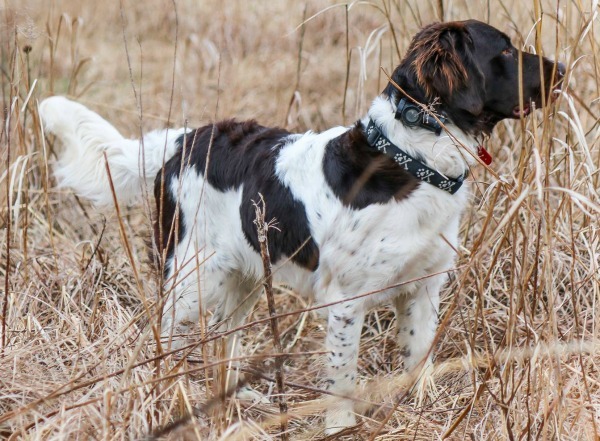 Additionally, her PennHip score places her in the top 98th percentile of all Small Munsterlanders in the US, which means her hips are tighter than 98% of other dogs tested. 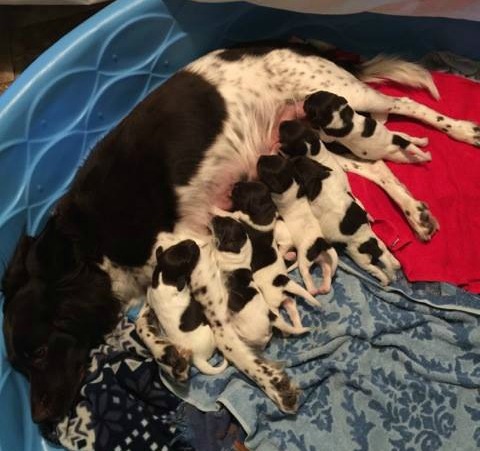 The tighter the hips, the less chance of developing hip dysplasia or osteoarthritis problems as she ages, and it also means her puppies have a higher chance of never developing those genetic problems either! Her PennHip score was .2/.16. Happy 4th of July from the little firecrackers at Mustain Kennels! 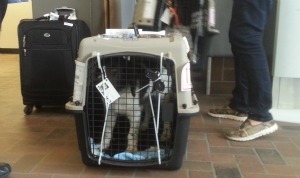 Today we welcomed our imported puppy Uros EBEN-EZER from Czechoslovakia! We want to thank breeder/owner Katerina Lisova for helping us import this beautiful pup and we are looking forward to more Czech puppies in the future! Top left, Ukon & Uron, top right is John at the airport. Above left is a map of Prague airport. Above right, Uros. 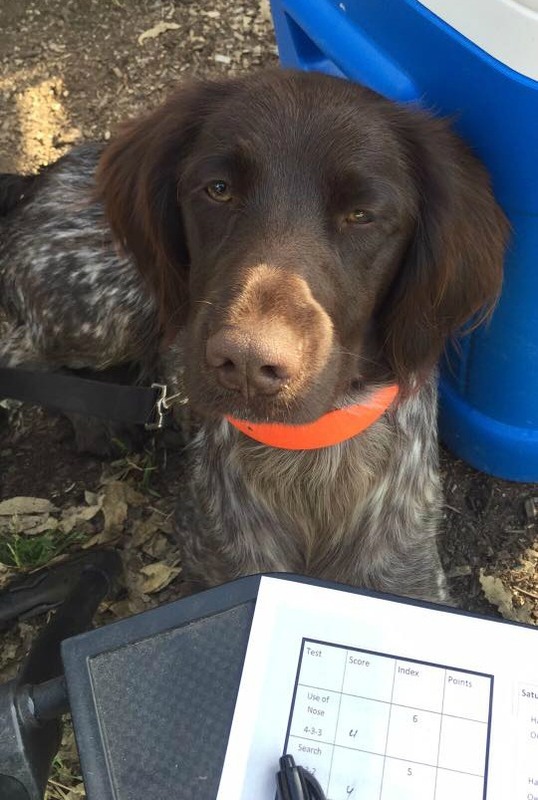 Congratulations to our Timber Trail's Emma (Emmie) who won 3rd place in the Annual Bird Derby, Puppy Division, held at the Annual SMCNA Conference this year in Brainard, Nebraska. 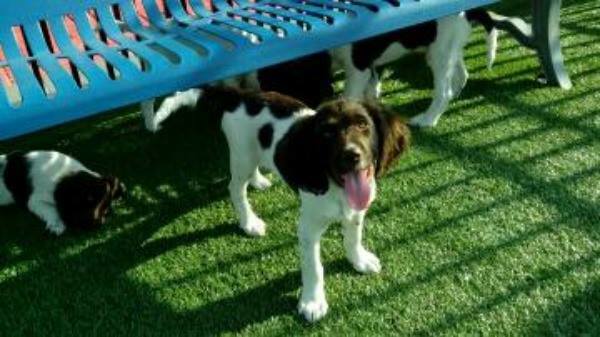 There was tough competition but Emmie showed great talent and natural ability at the young age of 8 months! 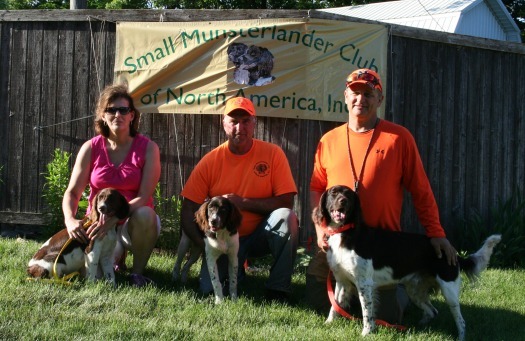 Had a great time at the Annual Small Munsterlander Club of North America (SMCNA) Annual Conference this year held at Kris and Jeff Hill's farm in Brainard, NE. Can't wait for next year! 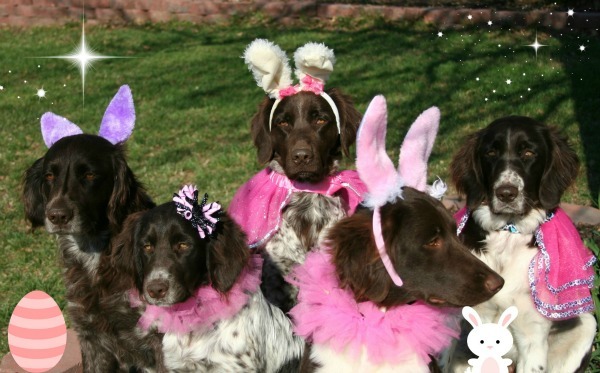 Hope everyone has a Happy Easter from the Mustain Kennels Pack (although they'd rather be chasing rabbits than dressed up like them!). Above: (L to R) Angus, Dani, Abi, Emmie and Asia. Happy Saint Patty's Day to you all from the little green pack at Mustain Kennels! months old! Way to go Covey and congratulations as well to her owners Kathy & Tom Waller - great job with training! 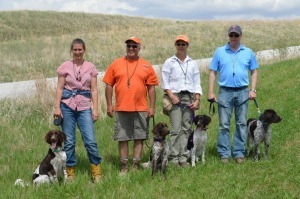 Above: (L to R) Greg Lewis w/ Hunting Hills Yukon Moose Tracks; Jeff Lorenzini w/ Quina Vom Frostweg; Carrah Whitaker (NAVHDA Field Marshall) w/ Hunting Hill's Yeager Kayden; Tom Waller w/ Mustain's Augustina Covey von Annalise and Joe Melstrom w/ Trigger. Congratulations to all the owners and their SMs - what an amazing picture of 5 beautiful Munsterlanders all testing at the same time! 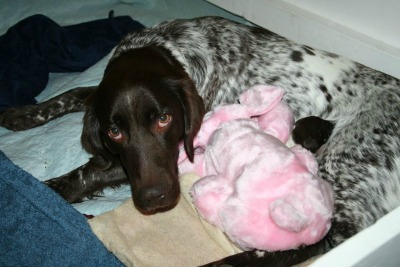 Happy Valentines Day to all you Sweethearts from the Pups in Pink at Mustain Kennels! Above: (L to R) Abi, Asia, Dani, Emmie and Angus. 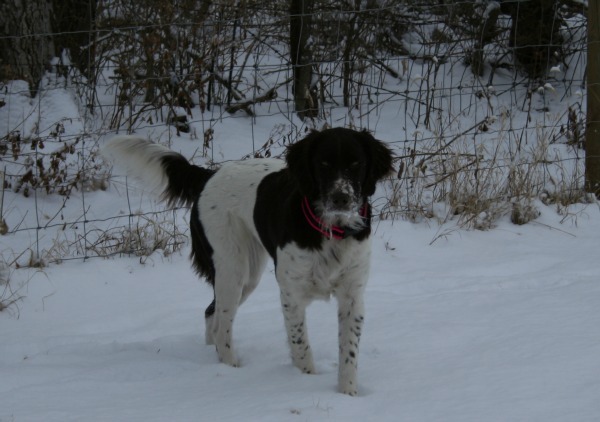 We'd like to share the wonderul news that our Uma Abigale (Abi) was approved to breed by the SMCNA Breed Counsel. Her hip report is in the top 2% in the US, meaning she has an extremely low chance of developing any type of hip dysplasia or osteo arthritis and it also means healthy, well structured puppies in her future! 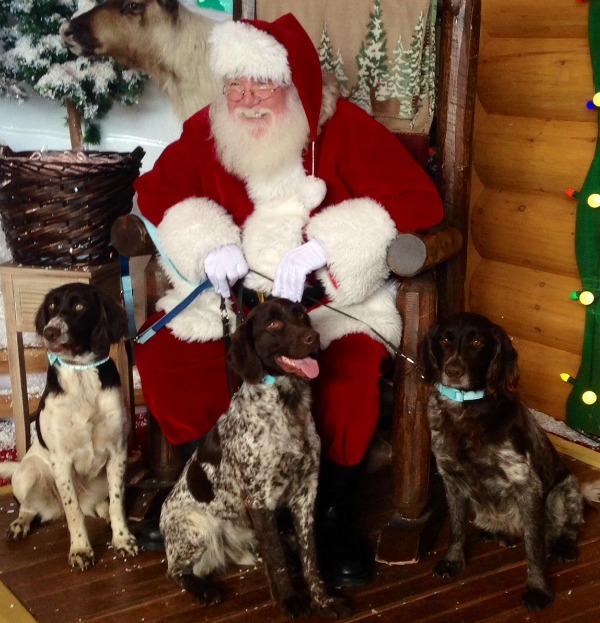 Merry Christmas from the Munsters at Mustain Kennels - Asia, Abi and Angus! 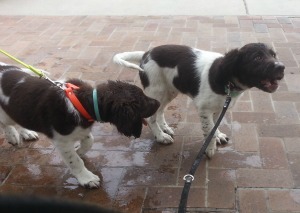 We are so excited to announce we have a new puppy! Please meet Daenerys Storm von Etta - we LOVE her already! 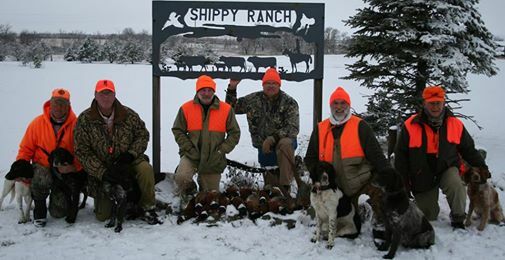 John is headed back from South Dakota today after attending the Annual Sportsmans Classic Tournament at Shippy Ranch - many thanks to the Shippy's for a wonderful weekend and great memories. 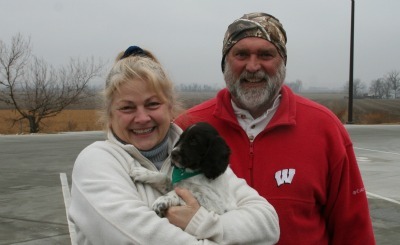 The 2014 Annual SMCNA Conference was held at Brushdale Farm in Maquaketa, Iowa and hosted by Michelle and Mark Wilbers. We had a wonderful time and attend several training classes over the weekend on conformation judging, first aid for your dog and several others - really great information! The bird derby is an annual event and last year Angus took 3rd place but unfortunately was beat out this year by Zip Hamele. At the awards ceremony, Sande was recognized with an Appreciation Award for her work as the SMCNA Treasurer and Board Member. 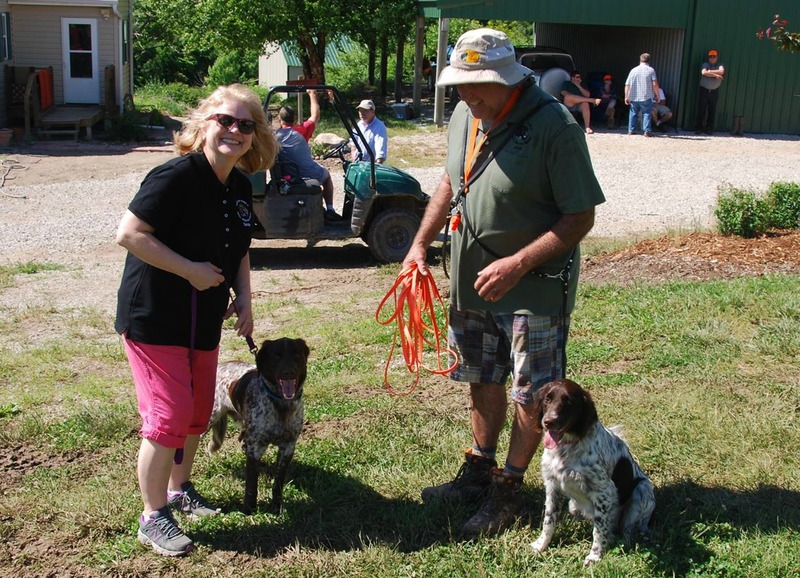 The Annual Conference next year will be held at Hunting Hills Farm in Brainard, Nebraska, so plan on attending - you'll have a wonderful and informative weekend! 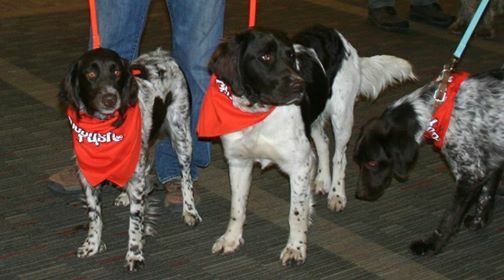 Above: (L to R) Michelle Wilbers with Mustain's Abby von Annalise; John Mustain with Mustain's Asia von Annalise and Jim Blaha with the pup's sire Castiron's Jet. We are proud to announce our Hunting Hill's Uma Abigale (Abi) took her NAVHDA Natural Ability test and scored a 110, Prize I. 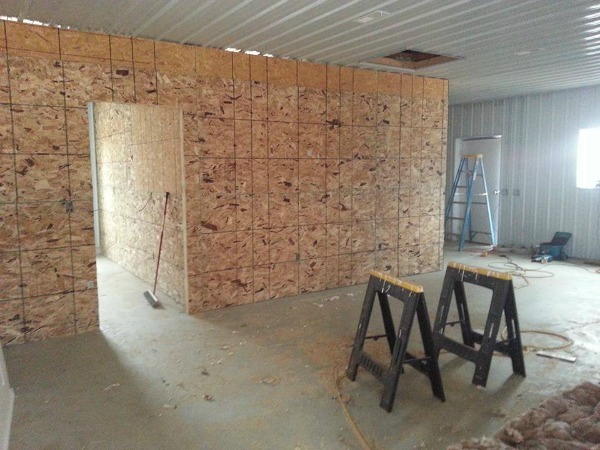 The testing was held in Thurman, Iowa and the NAVHDA judges were Darin Tolzin, Robert Ubbelohde and Charles Casanova. 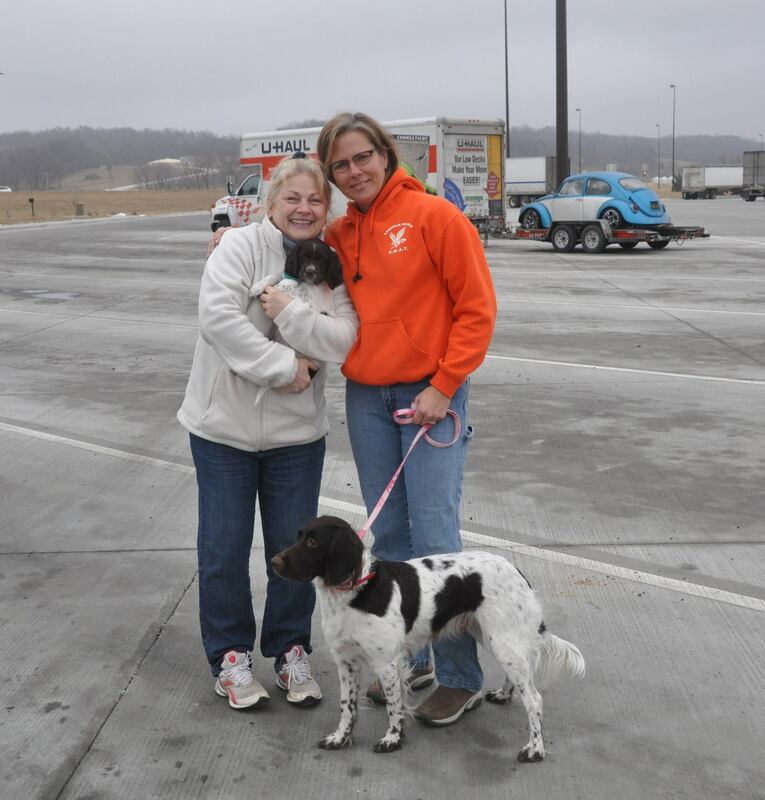 Pictured below are (L-R) Pat Helmich (with Robingun's Akira Chip), John Mustain (with Hunting Hill's Uma Abigale), Pam Robinson (with Wolfsburg's Etta Juwel - who is Akira's mom and came out to support her pup!) and Tim Watts (with Trigger, and Abi's brother!). Below right is Abi, getting ready to test! Way to go everyone, great job! 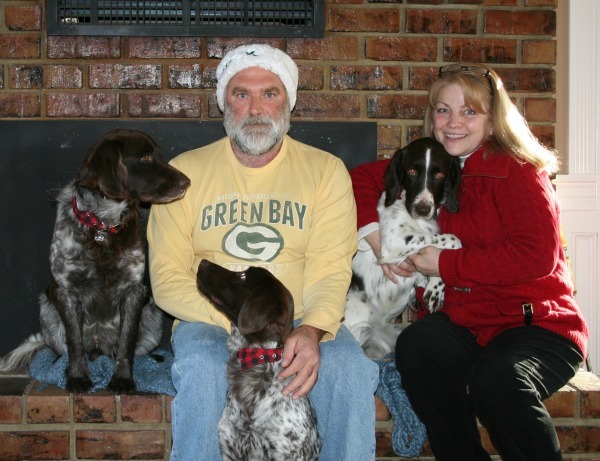 Merry Christmas to everyone from Mustain Kennels - Angus, John, Abi, Ani and Sande. 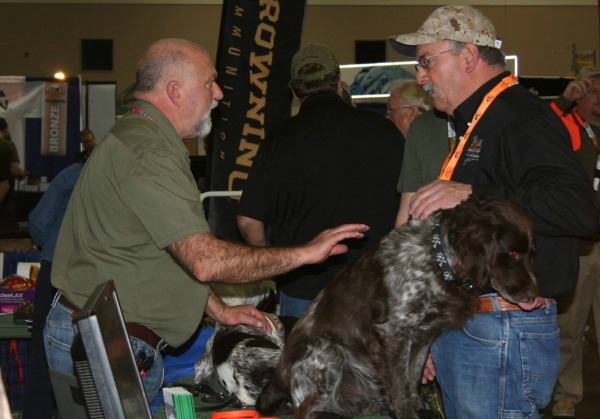 We are excited to announce John and Angus will be working the Small Munsterlander Club of North America (SMCNA) booth at Pheasant Fest, at Bartol Hall in downtown Kansas City today so stop by and check out our booth!